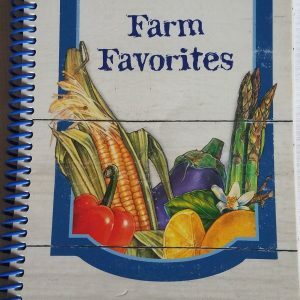 or the growers – of the spelt sold on this website. We grow it, have it cleaned, bagged and then ready for your purchase. We have a limited supply and we only sell what we grow here. We do not source spelt out from other growers. Harvest is in September, usually, and cleaned spelt is ready to be shipped out in October. 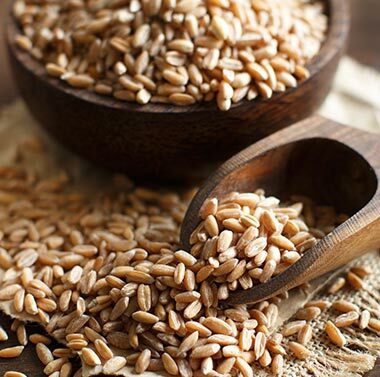 Spelt is an ancient NON-GMO grain that is slowly making a come-back in the United States. 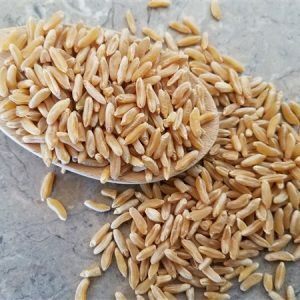 It has many properties that people are looking for: for one, it tends to be easier to digest and doesn’t cause uncomfortable bloating that some people experience when they eat hard red or hard white wheat. This is because spelt is more water-soluble – meaning it breaks down easier in your body. Some people who are sensitive to wheat have been known to be able to use spelt in their diets. Note: Spelt is not gluten free, but the gluten will break down easier in your body. Just because something says it is organic, doesn’t mean there were no chemicals used growing it, and reports say those organic chemicals are more toxic than conventional ones. We use an early herbicide, just to hold back the weeds so we actually have a crop to grow and don’t mix our spelt with wild oats or something else that would contaminate it. We also use fertilizer (it’s like taking vitamins) to maintain soil and crop health. Sometimes, when the plant is deprived of nutrients, it will make its own toxins, so we had our spelt tested and it came back clean with the report “no detection” from the Food Lab we sent it to. They conducted a thorough test to make sure it was clean from any chemical residue. Rest at ease when you buy from us. We will continue to test it to ensure the highest quality we can provide. HOW DO I USE SPELT? Spelt is fairly easily substituted into most recipes calling for flour. So, don’t throw away your old recipes that you loved and think you’ll never enjoy again. It just might take a few minor adjustments and a little practice. WHY IS OUR SPELT BETTER? We sell our Idaho-family-grown spelt in 50 pound bags of whole spelt kernels (berries). You will need a grain mill to make flour with your spelt or wheat. When you grind spelt into spelt flour, it is naturally light in color and ready for baking. 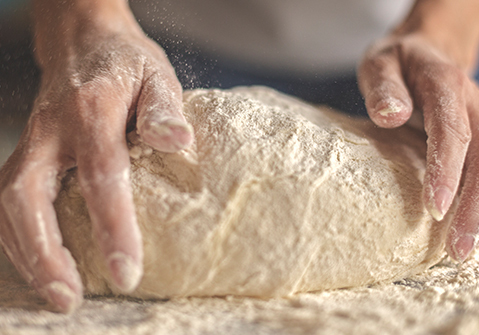 Spelt flour is best kept in a cool, dark place to maintain its excellent nutrient value. We repeatedly average a protein count of 13, which is great for baking and creating a consistent product. p.s. We have discontinued carrying spelt flour. It is better to mill your own. So if you need a grain mill, please check out the quality mills we carry.